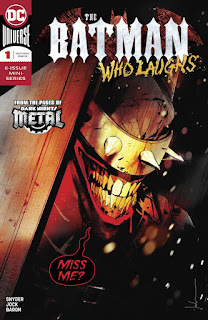 Batman Who Laughs #1 was the top-selling comic book in December, with orders (already known from the annual report) of more than 226,000 copies. DC had all five of the top five comics — yet in a month that was down 2% for the business overall, the publisher was down 11% in dollar orders versus December 2017. A possible contributing factor: DC only released 52 new comic books in December, which appears to be the lowest number in any month for that publisher since February 1991. (Click to see our 1991 page.) Meanwhile, Marvel, which had 90 comic books out, slightly over its annual average for 2018, was up 12% in dollars year-over-year in December. The fact that more new titles being offered often correlates with higher overall sales may not be much of a surprise; at the same time, it wouldn't be strange at all for publishers and retailers to prefer to have more profit coming in from a smaller number of titles that perform better on average. In December 2018, they got their way in that fully 11% fewer comic books came out versus the same month last year; at 398 releases, it was the smallest number in any month in at least four years. Yet the number of units sold in the month was only slightly down versus December 2017. However, that was not the rule during 2018 overall: we now know that 5,553 new comics came out in 2018, down 6% from the 5,919 in 2017 — and comics unit sales were down for the year by 6%. In 2018, lighter new release volume coincided with an equally lighter number of copies sold. The usual caveats with new-release volume measures apply. They count the number of unique comic book interiors, regardless of variant covers; the number of stories, if you will. 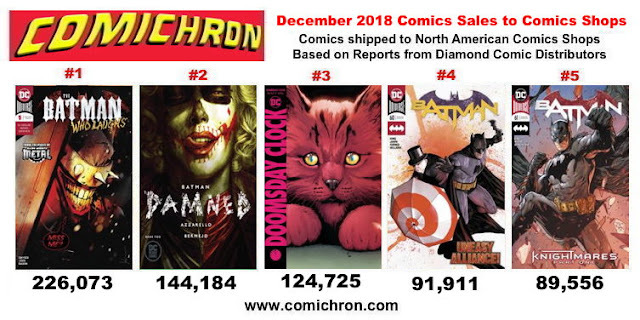 Retailers actually were coping with many more specific items to order and stock; 87% of the Top 1,000 comics of 2018 had variants, and 97% of the Top 100. But the median number of copies of a single comic book purchased by individual consumers is still one; total purchases do not increase in parallel with the number of variants, because most people just want one copy to read. It's the fact that that "one copy" might not be the main cover that makes retailers' lives more complicated. Diamond did not release quarterly and half-year information in its grids, but we calculate that were one to go just from the monthly charts, the quarter was slightly down, and the second half of the year was slightly up. No videos right away this month, as there's still a lot of data to digest, and the December estimates are yet to be done. Those estimates should appear here soon. 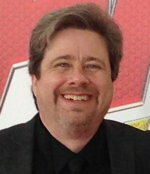 Comichron founder John Jackson Miller has tracked the comics industry for more than 25 years, including a decade editing the industry's retail trade magazine; he is the author of several guides to comics, as well as more than a hundred comic books for various franchises. He is the author of novels including the just-announced Star Trek: Discovery - The Enterprise War, releasing July 30 from Gallery Books, as well as Star Wars: Kenobi and the Star Trek: Prey trilogy. Read more about them at his fiction site.